When we lived in Taiwan fresh papaya was one of my son’s favourites. 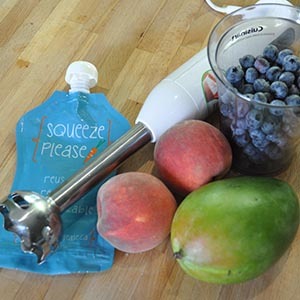 With both fruits so easy to mash, you can easily skip the blender and do this with a fork. Cut the papaya in half, scoop out flesh and toss into a blender. Add the banana. Blend quickly until desired texture. 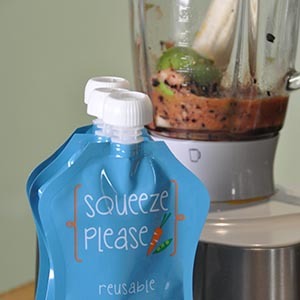 Pour into your Squeeze Please pouch and enjoy. When my son was still in his baby years, I would blanch and peel the peaches. Now that he’s much older, I keep the skins for extra nutrients and texture. Wash and cut the peaches in half. Remove the pit and cut into smaller chunks and toss into blender. Cut the mango in half, score with a knife and scoop out the flesh, toss into blender. Add the blueberries. Blend to desired texture.